In the face of ever-present societal pressure to expand, there are encouraging signs that the beginnings of a resistance to the trend has begun. There is now, at least some community acknowledgement[iv] that as a society, we must live within the confines of our long-term physical means and in recent years the concept of population carrying capacity has gained an increasing degree of public acceptance. For example, the Sunshine Coast Regional Council[v] has “committed to land-use planning based on the concept of sustainable carrying capacity, defined simply as the population that can be supported indefinitely by its supporting systems.” This growing awareness recently entered the federal sphere, with the Labor Government appointing a Sustainable Population minister Tony Burke, charged with establishing sustainable population guidelines. Burke[vi] states that, “we have to also take into account, do some sections of Australia have what - with my agriculture hat on - gets referred to as a carrying capacity?” Burke’s Sustainable Development Panel chair, Bob Carr[vii] sets out his position on carrying capacity as the opportunity to “link population growth to a number of variables” related to Australia’s inherent characteristics. While the idea of carrying capacity has at least gained a broader audience in recent years, there still exists a divergence in views on both the definition and contextual validity of carrying capacity assessment. In recent decades a variety of approaches have been testing in carrying capacity assessments, but generally the complex nature of modern lifestyles has complicated the process. For instance, in a globalised world, this form of resource accounting has presented methodological difficulties because resource production, consumption and waste assimilation are often spread across vastly differing demographic and geographic landscapes. In other words, international trade has warped the potential reliability of carrying capacity assessments. However, given compelling evidence of forthcoming resource depletion and the restrictions imposed by climate change, the question must be asked: Is it desirable, or even feasible, to perpetuate the existing highly energy-dependant globalised system of trade? If a less energy-intensive, more localised and reasonably self-reliant social configuration was adopted, how can practical planning methods, such as carrying capacity assessment, be activated to help guide this transition? To date, only a limited number of carrying capacity assessments have successfully been able to test the ability of physical environments to supply the resources and absorb the impacts of a local population. For instance, recent carrying capacity studies of New York State[viii] and Britain[ix] have effectively incorporated resource-based approaches while the more localised, Southeast Queensland analysis of Graymore[x] offers some insight into an impact-based methodology. However, few studies have used carrying capacity assessment as a means to dynamically highlight how potential changes in societal behaviours might influence carrying capacity estimates, and it seems that none have yet been able to condense their methodology into a succinct user-accessible model. In contrast, a derivative of carrying capacity analysis, the Ecological Footprint[xi], has gained much recognition[xii] in recent years as a dynamic interactive tool allowing users to determine their environmental impact on a global basis. 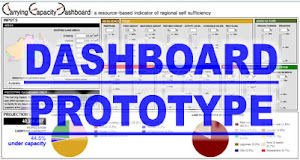 It is thus suggested that a combination of successful components from existing carrying capacity assessments together with the interactive potential displayed by Ecological Footprint analysis, can produce a localised, informative and easily-assessable carrying capacity assessment tool, the beginnings of which can be encapsulated in the Carrying Capacity Dashboard. [i] BIRDSELL, J. B. (1953) Some Environmental and Cultural Factors Influencing the Structuring of Australian Aboriginal Populations. The American Naturalist, 87, 171-207. [ii] RAPPAPORT, R. A. (1967) Pigs for the ancestors: Ritual in the ecology of a New Guinea people, New Haven, Yale University Press. [iii] SMITH, T. C. (1977) Nakahara, Stanford, Stanford University Press. [iv] Recent media articles include Hoffman HOFFMAN, B. (2009) Council set to fight growth push. Sunshine Coast Daily Online ed. Maroochydore., Courier Mail COURIER-MAIL (2010) Australia's population should be capped at 28 million, says Bob Carr. Courier Mail. Brisbane, AAP. and Sales SALES, L. (2009) Bracks, Carr discuss population growth. Lateline. ABC. [v] GARDINER, P. (2009) Both sides say use it or lose it. Noosa News. Noosa News. [vi] SALES, L. (2010) Sustainable population - leadership. ABC Lateline. [vii] KELLY, F. (2010) Panel discussion on population, Radio National Breakfast program. [viii] PETERS, C. J., WILKINS, J. L. & FICK, G. W. (2007) Testing a complete-diet model for estimating the land resource requirements of food consumption and agricultural carrying capacity: The New York State example. Renewable Agriculture & Food Systems, 22, 145-153. [ix] FAIRLIE, S. (2010) Meat: A benign extravagance, East Meon, UK, Permanent Publications. [x] GRAYMORE, M. (2005) Journey to Sustainability: Small regions, sustainable carrying capacity and sustainability assessment methods, PhD Thesis. Faculty of Environmental Sciences. Brisbane, Griffith University. [xi] CSE (2010) Ecological Footprint Quiz. Santa Fe, New Mexico, Center for Sustainable Economy. [xii] SUTCLIFFE, M., HOOPER, P. & HOWELL, R. (2008) Can eco-footprinting analysis be used successfully to encourage more sustainable behaviour at the household level? Sustainable Development, 16, 1-16.